16:53 | Lima, Nov. 7. Lima-based San Marcos University is hosting the Fudan-Latin America University Consortium (FLAUC) Second Annual Meeting that gathers representatives from Fudan University (China) and 12 Latin American higher education institutions. The goals are to establish and deepen academic-scientific cooperation among participants, address issues of global concern, and propose solutions to problems facing the academy and the State, such as climate change, sustainable development, and the university's role in political decisions. During the opening, held at San Marcos Cultural Center General Hall, Rector Orestes Cachay said this meeting confirms San Marcos University has developed the best strategic alliance as it constitutes a suitable academic space to share knowledge with experts from all over the world. As is known, San Marcos joined the abovementioned consortium —as a founding member— at the Shanghai Forum 2017. "If you want to go fast, go alone. If you want to go far, go together," was the proverb quoted by the Peruvian rector to clarify the meaning of communion sought by FLAUC members. He also reiterated the Lima-based university's commitment to come up with solutions to problems facing Peru and the world. 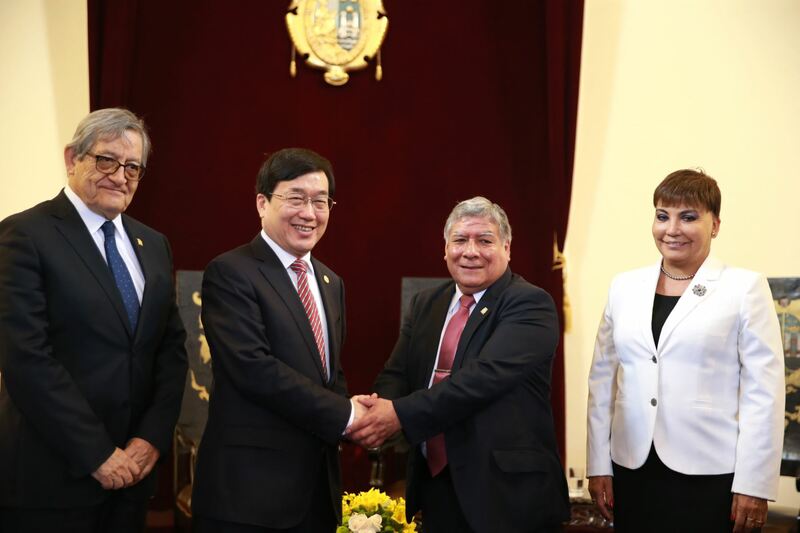 For his part, Fudan University President Xu Ningsheng upheld the value of Latin America and its ancient history through civilizations like the Mayas, the Aztecs, the Incas, and the current one, which the FLAUC Second Annual Meeting is intended to join as a collaborator. The Consortium is intended to serve as a platform for exchange, communication, and cooperation between Fudan University and prestigious universities in Latin America. It aims to contribute to the construction of long-term cooperation including, but not limited to academic conferences, faculty exchanges, research, and annual leadership meetings. The platform is expected to strengthen mutual understanding, inspire thoughts, spread ideas, and build up a reputation.